In honor of the Feast of Our Lady of Guadalupe, [December 12th] here are ten amazing facts about the image of Our Lady as seen on Saint Juan Diego &apos;s tilma that defy scientific explanation and argue in favor of its miraculous origin and divine provenance. Mary’s message of faith still speaks to us, 485 years later. Infrared photography has demonstrated that there is no sketching on the image whatsoever. Dr. Philip Callahan, a research biophysicist from the University of Florida explains: "It is inconceivable that an artist in the 16th Century would paint a portrait without first doing a drawing on it." Making an under-sketch prior to painting a portrait goes back to antiquity. Such an exquisite depiction on textile made from cactus fiber is inexplicable given the lack of sketching. 2. The image has lasted and shows no signs of deterioration. Juan Diego&apos;s tilma is made of a rough cactus fiber which normally disintegrates in 15 to 30 years. Yet, the image of Guadalupe has remained intact for 484 years without fading or cracking. Moreover, it was subjected to candle smoke for many years, which should have accelerated the process of deterioration. In 1778, a worker accidentally spilled strong nitric acid onto a large portion of the image. To everyone&apos;s astonishment, only slight stains appeared which can still be seen in the upper right side. Additionally, in 1921 a bomb concealed in some flowers was placed on the altar directly under the image. When the bomb detonated, the marble altar rail and windows 150 feet away were shattered, a brass crucifix was twisted out of shape, but the image was left unharmed. 3. The stars that appear on the image are astronomically correct. In 1983 Dr. Juan Homero Hernandez and Fr. Mario Rojas Sánchez discovered that the stars on the image correspond precisely to the constellations of the winter sky on December 12th, 1531. Incredibly, the constellations are shown as viewed from outside the heavens, in other words in reverse. It is as if we have a picture from someone looking at it from outside the universe, it is a snapshot of heaven and earth from the very moment that Juan Diego saw Our Lady. Also, the constellation Virgo, representing virginal purity, appears over the area of Mary&apos;s heart signifying her immaculate and virginal purity, and the constellation Leo the lion is over her womb. The lion represents Jesus Christ, because Christ is the lion of the tribe of Judah. This emphasizes that Christ the King is present in Mary&apos;s womb. The perfect placement of stars in their various constellations illustrates the infinite intelligence behind the miraculous image. 4. Mary&apos;s eyes are astonishingly life like. Of all the characteristics of the image, this is perhaps the most astounding. The microscopic likeness of a bearded man was discovered in the pupils of the Virgin; first in 1929, and again in 1951. The bearded man corresponds to contemporaneous pictures of Juan Diego. No human painter could have foreseen putting infinitesimally small images of Juan Diego in the eyes of the Virgin so that later advances in human technology could detect them. Furthermore, it is impossible for any human to have painted the images because they are simply too miniscule to produce. Jose Aste Tonsmann, a Peruvian ophthalmologist, examined Mary&apos;s eyes at 2,500 times magnification. He was able to identify thirteen individuals in both eyes at different proportions, just as a human eye would reflect an image. It appeared to be the very moment Juan Diego unfurled the tilma before Bishop Zumárraga. Dr. Jorge Escalante Padilla a surgical ophthalmologist considers these reflections to belong to the type which have been described by Cherney on the back surface of the cornea and by Watt & Hess at the center of the lens. Such reflections are very difficult to detect. Dr. Escalante also reported the discovery of small veins on both of the eyelids of the image. In the 1970s, a Japanese optician who was examining the eyes fainted. Upon recovering he stated: "The eyes were alive and looking at him." [Janet Barber, Latest Scientific Findings on the Images in the Eyes, page 90.] 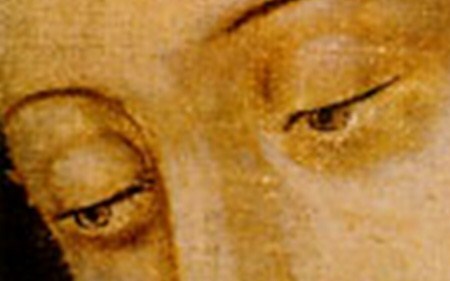 Incredibly, when Our Lady’s eyes are exposed to light, the pupils contract. When the light is withdrawn, they return to a dilated state. 5. Mary assumes a different ethnicity depending on one&apos;s vantage point. It is remarkable that at one distance Our Lady appears to be a Native American, but at another distance she appears of European descent. This miraculous feature is meant to show the unity of the two peoples and the two cultures in light of the true faith of Christ. Mary implored the peoples of the New World to live as one. At a distance of six or seven feet the skin tone becomes what might best be termed Indian olive, grey green in tone, it appears somehow the grey and caked looking white pigment of the face and the hands combines with the rough surface of the un-sized hue, such a technique would be an impossible accomplishment in human hands, it often occurs in nature however, in the coloring of the bird feathers and butterfly scales and on the elytra of brightly colored beetles. This change in color at different distances occurring in nature happens on the tilma in a miraculous way. The pigment combines with the rough surface of the cloth to impart alternating colorations. No human artist can duplicate this effect. Such evidence strongly suggests the image was fashioned by a divine hand. 6. The image is always 98.6°F; the temperature of the human body. Also, Dr. Carlos Fernandez del Castillo, a Mexican gynecologist, after carefully examining the tilma and the image of the pregnant Madonna concluded that the dimensions of her body were that of an expectant mother at the end of gestation. 7. How the native Indian population interpreted the image of Our Lady. The Indians saw something in the image of Our Lady that the Spaniards did not comprehend. In that period, the Indians did their writing in hieroglyphics, so to them the image was a hieroglyphic letter. The fact that the natives read the image is most important in understanding the purpose of Our Lady’s apparitions. To the Indians the image depicted a beautiful lady standing in front of the sun, a sign to them that she was greater than the sun god Huitzilopochtli whom they worshiped; the crescent or the moon beneath her feet showed that their moon god Tezcatlipoca was less than nothing since she was standing on it; the stars they thought so much of were only a part or portion of her mantle. At her throat was a brooch with a small black cross in the center reminding them that this was the emblem of the Spanish Friars and there was one greater than she. The intelligence that constructed the image of Guadalupe conveyed exactly the message that the Indians needed to hear and to see to abandon their false notions of God and their idolatrous practices. It is infinitely insightful, well beyond anything humans could imagine. Reading the image caused millions of Indians to convert to the Catholic faith. 8. A 2007 miracle emphasizes Our Lady as the Patroness of the Unborn. Among Our Lady of Guadalupe’s many designations, she is venerated as the patroness of the unborn. The image shows Mary as pregnant with Christ. She is an unmistakable witness to the sanctity of life and the protection of the unborn. On April 24, 2007, an unusual luminosity in the famed image of Mary at the Shrine of Guadalupe in Mexico City immediately after that city legalized abortion became visible. According to one account: "At the end of the Mass, which was offered for aborted children... While many of the faithful were taking photographs of the tilma of Tepeyac, exposed and venerated in the Basilica... the image of the Virgin began to erase itself, to give place to an intense light which emanated from her abdomen, constituting a brilliant halo having the form of an embryo. Below, centered and enlarged, one can appreciate the location of the light which shone from the stomach of the Virgin and is not a reflection, or [otherwise] an artifact." Engineer, Luis Girault, who studied the picture and confirmed the authenticity of the negative, was able to specify that it had not been modified or altered, i.e: by superimposition of another image. He determined that the image does not come from any reflection, but originates from inside Mary. The produced light is very white, pure and intense, different from habitual photographic lights produced by flashes. 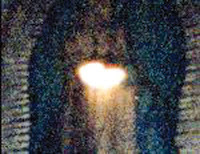 The light, encircled with a halo, appears to float inside Mary&apos;s abdomen. The halo has the form and measurements of an embryo. If we again examine the picture by making it turn in a sagittal plane, we perceive inside the halo some areas of shade that are characteristic of a human embryo in the maternal womb. 9. Our Lady of Guadalupe and the miraculous roses. The Spanish rulers of the native population were brutal, and war between them seemed inevitable. In 1531, the archbishop of Mexico City, Juan de Zumárraga prayed to Our Lady for peace. As a sign that his petition would be granted, he asked to receive roses native to his home region of Castile, Spain. Our Lady told Juan Diego to present Bishop Zumárraga her request that a church be built for her on the hill of Tepeyac (now part of Mexico City) where people could receive God&apos;s grace. Bishop Zumárraga was skeptical of Diego&apos;s account and asked that Our Lady produce a sign verifying her identity. That afternoon, Mary instructed Juan Diego to return the next day (December 11th) and she would provide proof. That night, however, Diego&apos;s uncle became deathly ill, and Diego never returned. Early the morning of December 12th, Diego journeyed to Tlatleloco to find a priest so his uncle could confess his sins before dying. In doing so, he passed Tepeyac Hill. Afraid Mary would interrupt his errand, he went to the other side of the hill, but Our Lady came to meet him. Mary assured Diego his uncle would recover. She told him to go to the top of the hill and gather the flowers there. Diego discovered, growing in the frozen earth, a miraculous garden of castilian roses not native to Mexico. Diego brought them to Mary, who arranged them in his tilma, with instructions that he take them to the bishop. Before Bishop Zumárraga, Juan Diego opened his cloak. The roses fell to the floor revealing the image of Mary. The Bishop&apos;s prayers had been answered. 10. Mary’s conversion of millions counteracted Luther’s Reformation. Our Lady’s urgent message was one of faith, hope and comfort to the indigenous population oppressed by their Spanish overseers. In a matter of months, she ended the Aztec culture’s cult of death. The Aztec religion involved human sacrifice on an unthinkable scale. In the decade following her appearance, ten million Indians converted to Catholicism, creating a vibrant community of faith that persists to the present day. In Europe, the Protestant Reformation raged, dividing the Church and causing millions to turn to Protestantism. At the moment that millions in Europe were being torn from the Church founded by Christ, God was arranging for twice as many in the New World to be brought into it. By divine Providence, Our Lady was creating unity and a wellspring of deep devotion among the faithful in Mexico. Her words to Juan Diego, “My dear child. Am I not here, I, who am your Mother? Are you not under my shadow and protection? Am I not the source of your joy? Are you not in the hollow of my mantle, in the crossing of my arms?”, made him, and his fellow Indians, in every way the Spaniards equals in dignity.